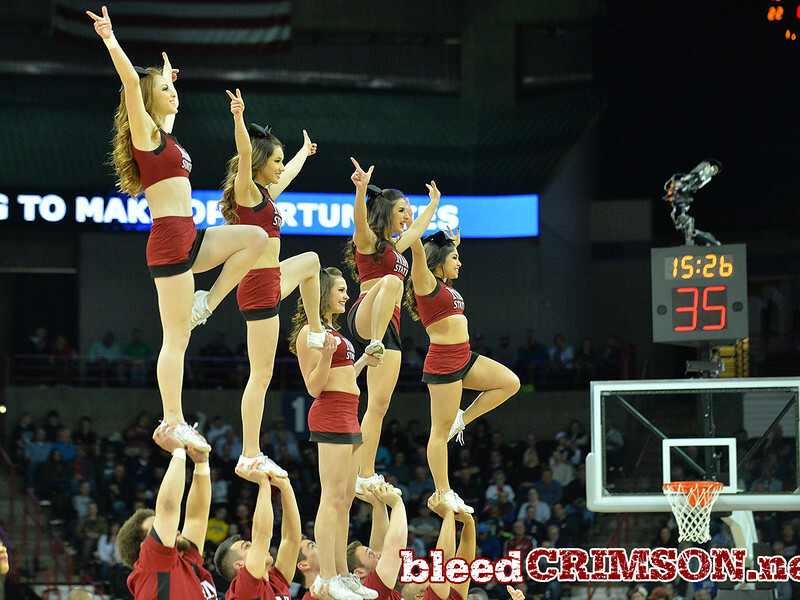 March 20, 2014: San Diego State Aztecs cheerleaders usher out the Aztecs before a second round game of the NCAA Division I Men's Basketball Championship between the 4-seed San Diego State Aztecs and the 13-seed New Mexico State Aggies at Spokane Arena in Spokane, Wash. San Diego State defeated New Mexico State 73-69 in overtime. 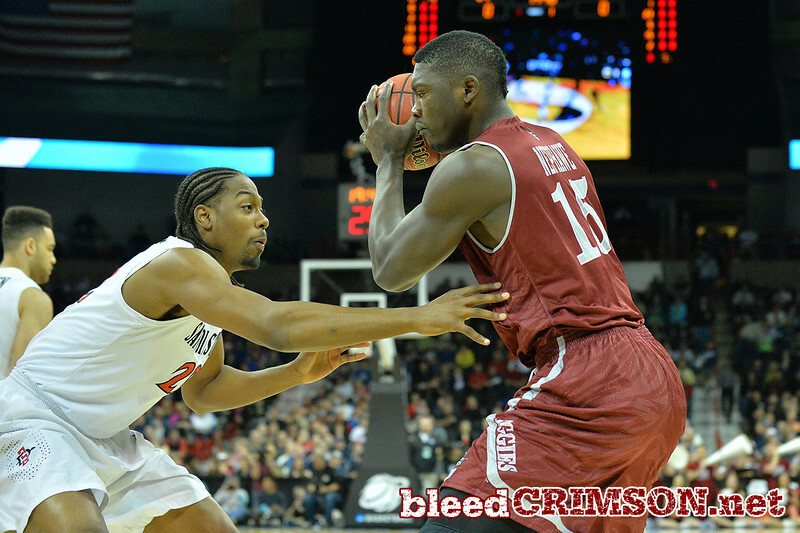 March 20, 2014: New Mexico State Aggies center Tshilidzi Nephawe (15) looks to get to the basket against San Diego State Aztecs forward Josh Davis (22) during a second round game of the NCAA Division I Men's Basketball Championship between the 4-seed San Diego State Aztecs and the 13-seed New Mexico State Aggies at Spokane Arena in Spokane, Wash. San Diego State defeated New Mexico State 73-69 in overtime. 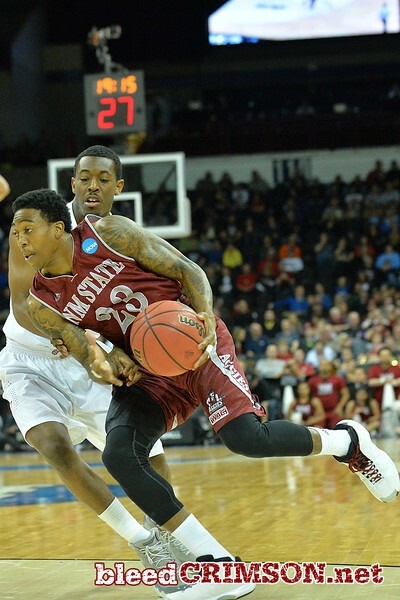 March 20, 2014: New Mexico State Aggies guard DK Eldridge (1) passes the ball during a second round game of the NCAA Division I Men's Basketball Championship between the 4-seed San Diego State Aztecs and the 13-seed New Mexico State Aggies at Spokane Arena in Spokane, Wash. San Diego State defeated New Mexico State 73-69 in overtime. 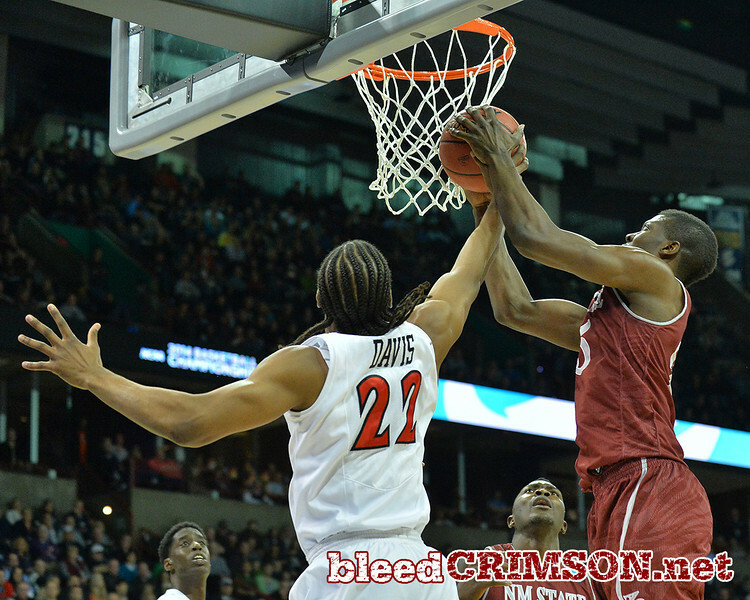 March 20, 2014: New Mexico State Aggies center Tshilidzi Nephawe (15) battles for a rebound against San Diego State Aztecs forward Josh Davis (22) during a second round game of the NCAA Division I Men's Basketball Championship between the 4-seed San Diego State Aztecs and the 13-seed New Mexico State Aggies at Spokane Arena in Spokane, Wash. San Diego State defeated New Mexico State 73-69 in overtime. 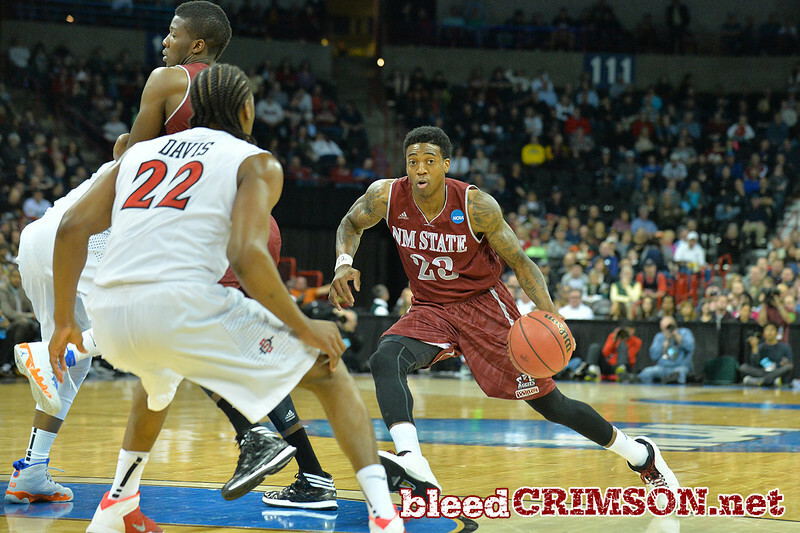 March 20, 2014: New Mexico State Aggies guard DK Eldridge (1) brings the ball up the court during a second round game of the NCAA Division I Men's Basketball Championship between the 4-seed San Diego State Aztecs and the 13-seed New Mexico State Aggies at Spokane Arena in Spokane, Wash. San Diego State defeated New Mexico State 73-69 in overtime. 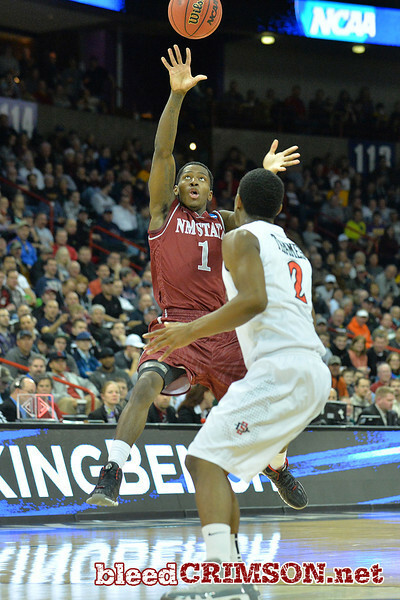 March 20, 2014: New Mexico State Aggies guard Daniel Mullings (23) drives to the basket during a second round game of the NCAA Division I Men's Basketball Championship between the 4-seed San Diego State Aztecs and the 13-seed New Mexico State Aggies at Spokane Arena in Spokane, Wash. San Diego State defeated New Mexico State 73-69 in overtime. 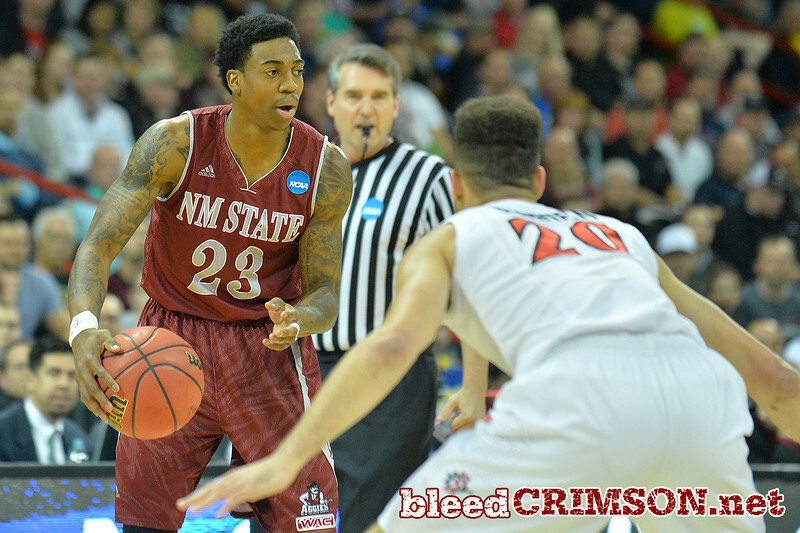 March 20, 2014: New Mexico State Aggies guard Daniel Mullings (23) brings the ball up the court against San Diego State Aztecs forward JJ O'Brien (20) during a second round game of the NCAA Division I Men's Basketball Championship between the 4-seed San Diego State Aztecs and the 13-seed New Mexico State Aggies at Spokane Arena in Spokane, Wash. San Diego State defeated New Mexico State 73-69 in overtime. 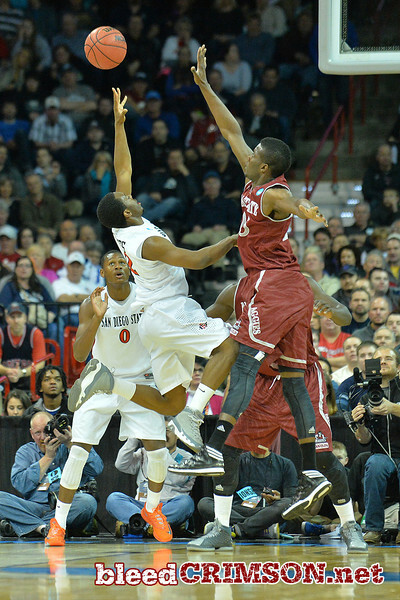 March 20, 2014: New Mexico State Aggies guard Daniel Mullings (23) passes to New Mexico State Aggies center Sim Bhullar (2) during a second round game of the NCAA Division I Men's Basketball Championship between the 4-seed San Diego State Aztecs and the 13-seed New Mexico State Aggies at Spokane Arena in Spokane, Wash. San Diego State defeated New Mexico State 73-69 in overtime. 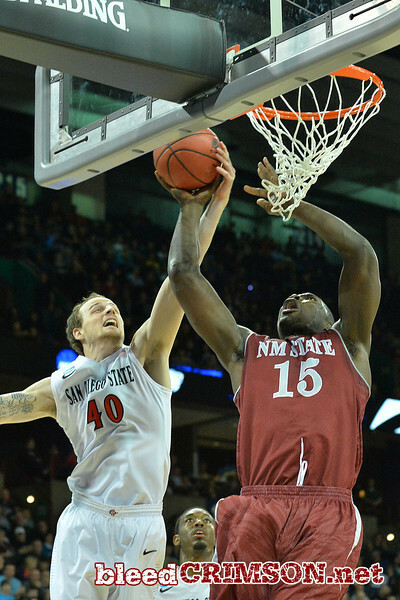 March 20, 2014: New Mexico State Aggies center Tshilidzi Nephawe (15) is fouled by San Diego State Aztecs forward Skylar Spencer (0) on the way to the basket by during a second round game of the NCAA Division I Men's Basketball Championship between the 4-seed San Diego State Aztecs and the 13-seed New Mexico State Aggies at Spokane Arena in Spokane, Wash. San Diego State defeated New Mexico State 73-69 in overtime. 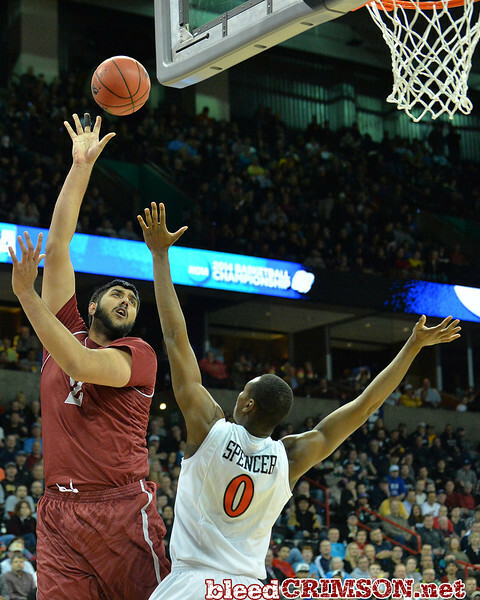 March 20, 2014: New Mexico State Aggies center Sim Bhullar (2) shoots over San Diego State Aztecs forward Skylar Spencer (0) during a second round game of the NCAA Division I Men's Basketball Championship between the 4-seed San Diego State Aztecs and the 13-seed New Mexico State Aggies at Spokane Arena in Spokane, Wash. San Diego State defeated New Mexico State 73-69 in overtime. 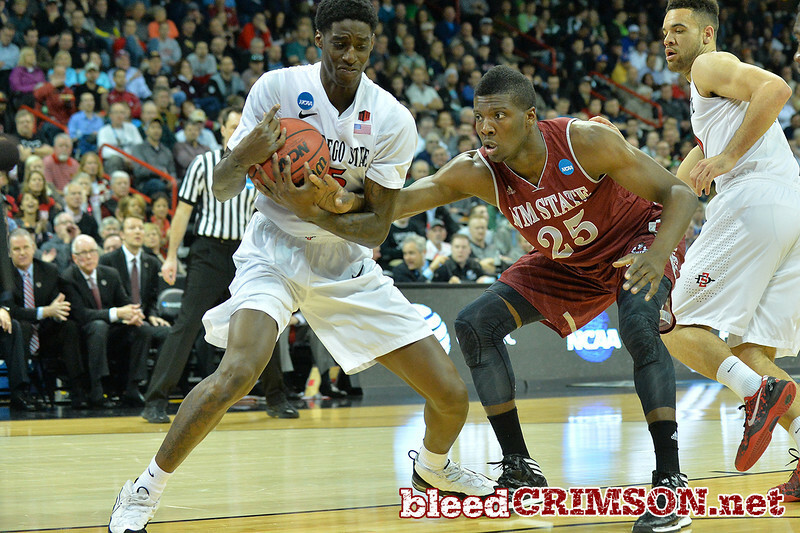 March 20, 2014: New Mexico State Aggies guard Daniel Mullings (23) surveys the defense during a second round game of the NCAA Division I Men's Basketball Championship between the 4-seed San Diego State Aztecs and the 13-seed New Mexico State Aggies at Spokane Arena in Spokane, Wash. San Diego State defeated New Mexico State 73-69 in overtime. 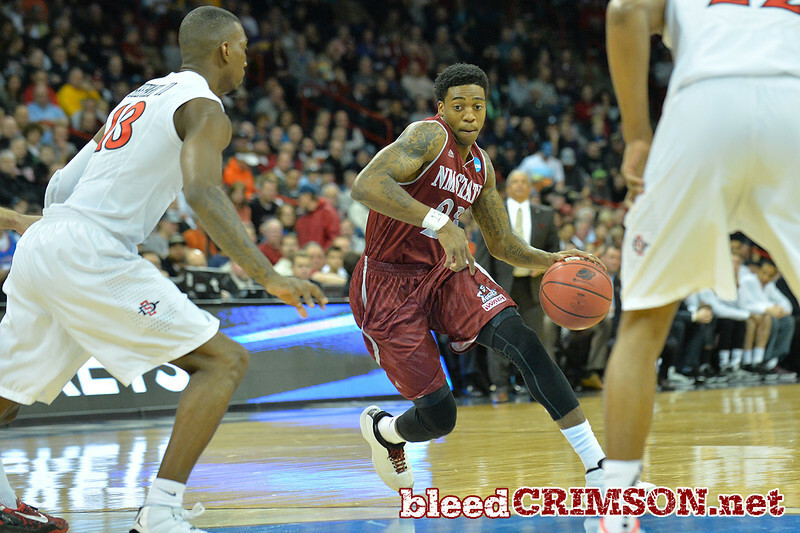 March 20, 2014: New Mexico State Aggies guard Daniel Mullings (23) drives into the lane during a second round game of the NCAA Division I Men's Basketball Championship between the 4-seed San Diego State Aztecs and the 13-seed New Mexico State Aggies at Spokane Arena in Spokane, Wash. San Diego State defeated New Mexico State 73-69 in overtime. 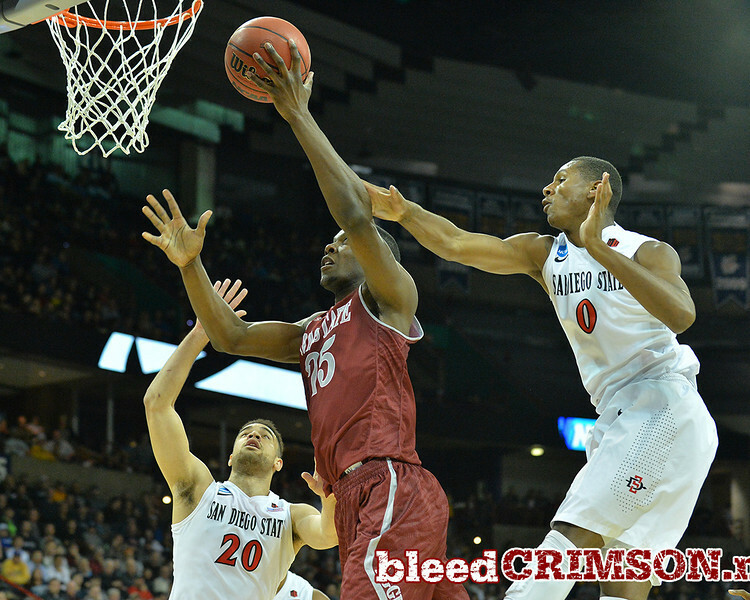 March 20, 2014: New Mexico State Aggies center Tshilidzi Nephawe (15) battles San Diego State Aztecs forward Skylar Spencer (0) and San Diego State Aztecs forward Josh Davis (22) for a rebound during a second round game of the NCAA Division I Men's Basketball Championship between the 4-seed San Diego State Aztecs and the 13-seed New Mexico State Aggies at Spokane Arena in Spokane, Wash. San Diego State defeated New Mexico State 73-69 in overtime. 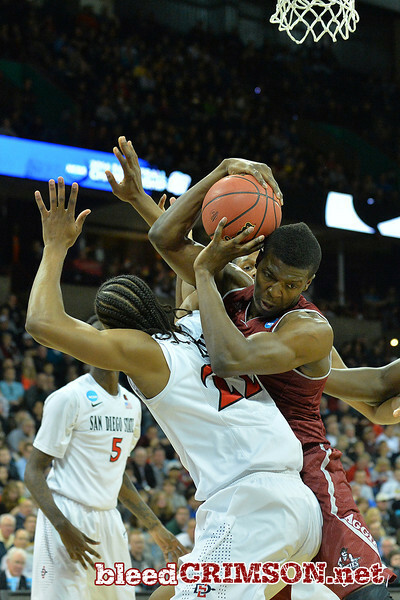 March 20, 2014: New Mexico State Aggies center Tshilidzi Nephawe (15) and New Mexico State Aggies guard DK Eldridge (1) battles a San Diego State Aztecs player for a rebound during a second round game of the NCAA Division I Men's Basketball Championship between the 4-seed San Diego State Aztecs and the 13-seed New Mexico State Aggies at Spokane Arena in Spokane, Wash. San Diego State defeated New Mexico State 73-69 in overtime. 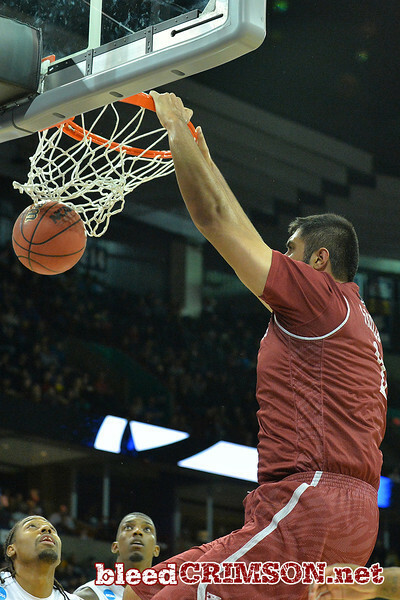 March 20, 2014: New Mexico State Aggies center Sim Bhullar (2) dunks during a second round game of the NCAA Division I Men's Basketball Championship between the 4-seed San Diego State Aztecs and the 13-seed New Mexico State Aggies at Spokane Arena in Spokane, Wash. San Diego State defeated New Mexico State 73-69 in overtime. 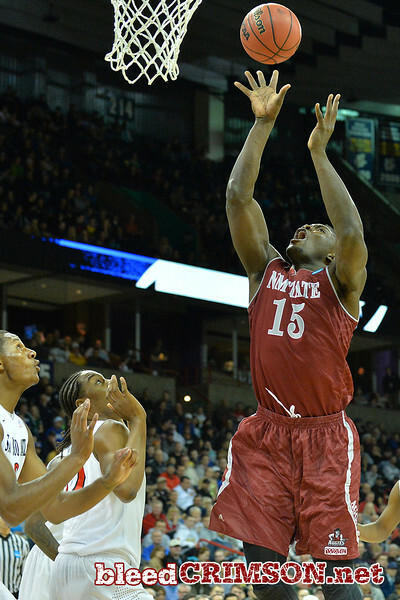 March 20, 2014: New Mexico State Aggies center Tshilidzi Nephawe (15) puts up a shot during a second round game of the NCAA Division I Men's Basketball Championship between the 4-seed San Diego State Aztecs and the 13-seed New Mexico State Aggies at Spokane Arena in Spokane, Wash. San Diego State defeated New Mexico State 73-69 in overtime. 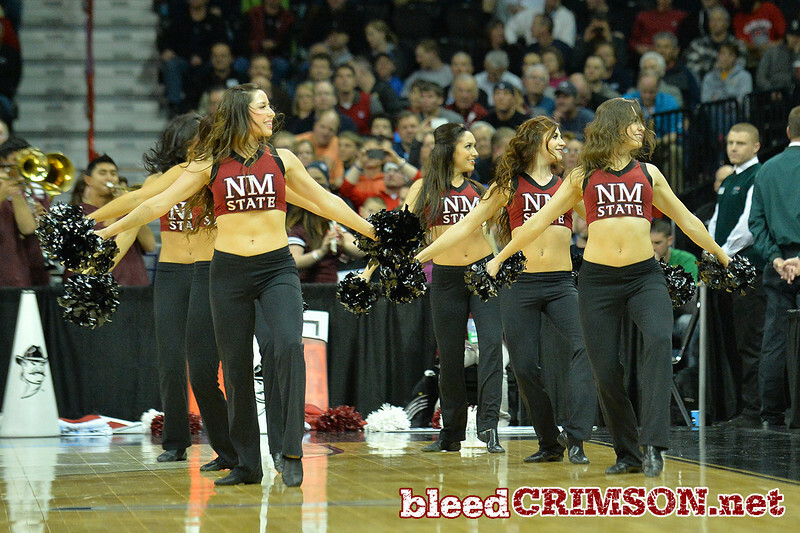 March 20, 2014: New Mexico State Aggies cheerleaders perform during a second round game of the NCAA Division I Men's Basketball Championship between the 4-seed San Diego State Aztecs and the 13-seed New Mexico State Aggies at Spokane Arena in Spokane, Wash. San Diego State defeated New Mexico State 73-69 in overtime. 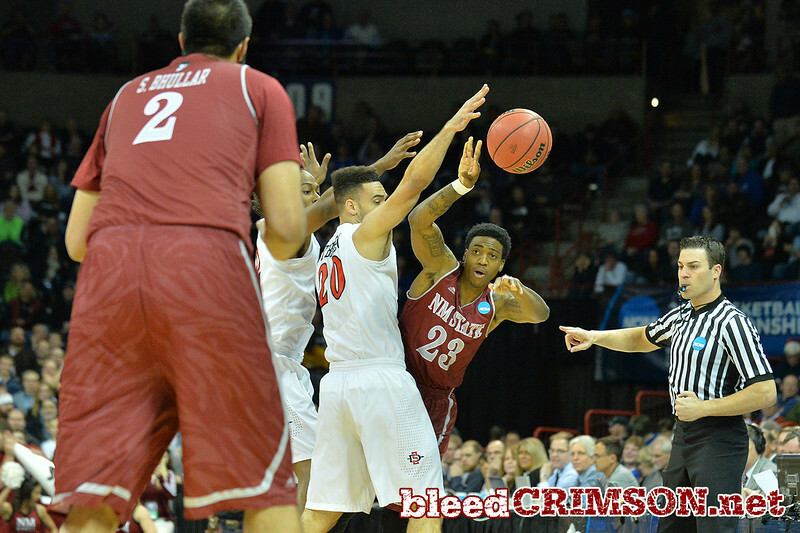 March 20, 2014: Members of the New Mexico State Aggies Sunders perform during a second round game of the NCAA Division I Men's Basketball Championship between the 4-seed San Diego State Aztecs and the 13-seed New Mexico State Aggies at Spokane Arena in Spokane, Wash. San Diego State defeated New Mexico State 73-69 in overtime. 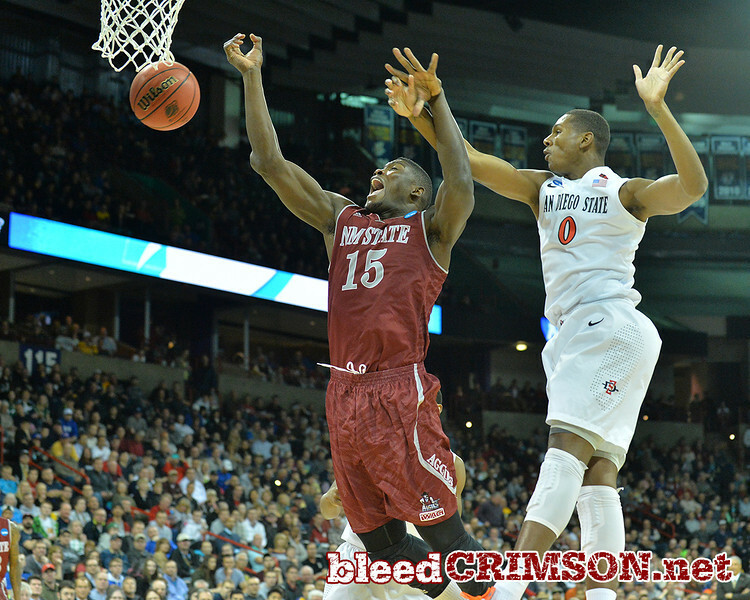 March 20, 2014: New Mexico State Aggies guard DK Eldridge (1) throws an alley-oop pass during a second round game of the NCAA Division I Men's Basketball Championship between the 4-seed San Diego State Aztecs and the 13-seed New Mexico State Aggies at Spokane Arena in Spokane, Wash. San Diego State defeated New Mexico State 73-69 in overtime. 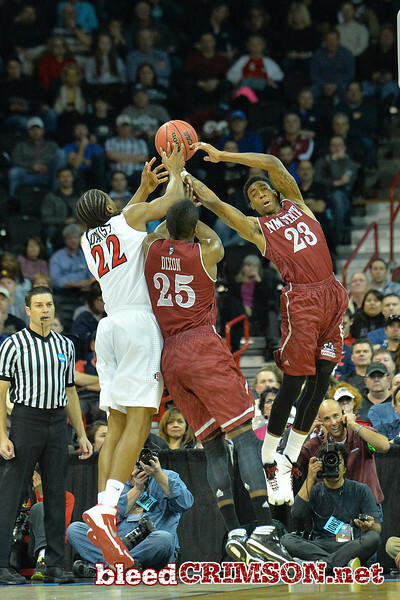 March 20, 2014: New Mexico State Aggies guard Daniel Mullings (23) tries to grab an alley-lop pass during a second round game of the NCAA Division I Men's Basketball Championship between the 4-seed San Diego State Aztecs and the 13-seed New Mexico State Aggies at Spokane Arena in Spokane, Wash. San Diego State defeated New Mexico State 73-69 in overtime. 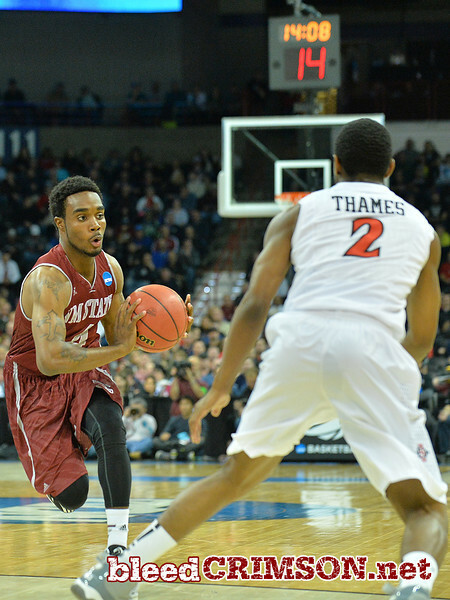 March 20, 2014: New Mexico State Aggies guard Ian Baker (4) passes the ball during a second round game of the NCAA Division I Men's Basketball Championship between the 4-seed San Diego State Aztecs and the 13-seed New Mexico State Aggies at Spokane Arena in Spokane, Wash. San Diego State defeated New Mexico State 73-69 in overtime. 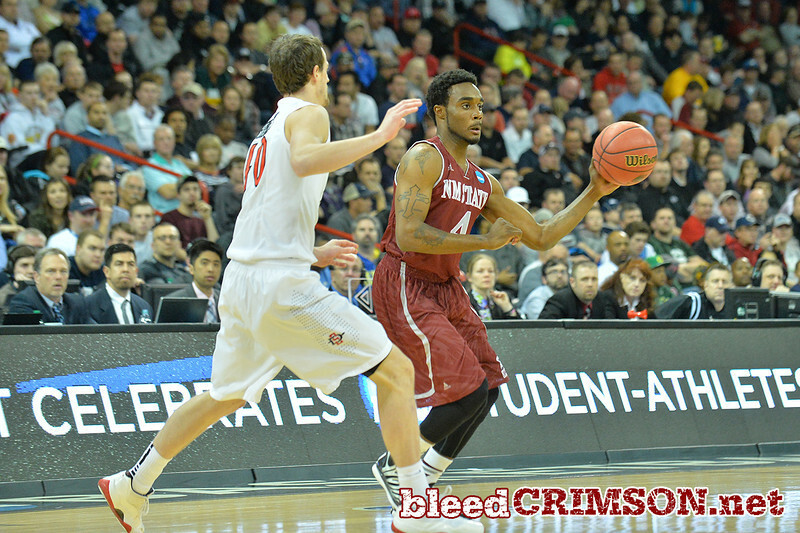 March 20, 2014: New Mexico State Aggies guard Travon Landry (0) looks to pass during a second round game of the NCAA Division I Men's Basketball Championship between the 4-seed San Diego State Aztecs and the 13-seed New Mexico State Aggies at Spokane Arena in Spokane, Wash. San Diego State defeated New Mexico State 73-69 in overtime. 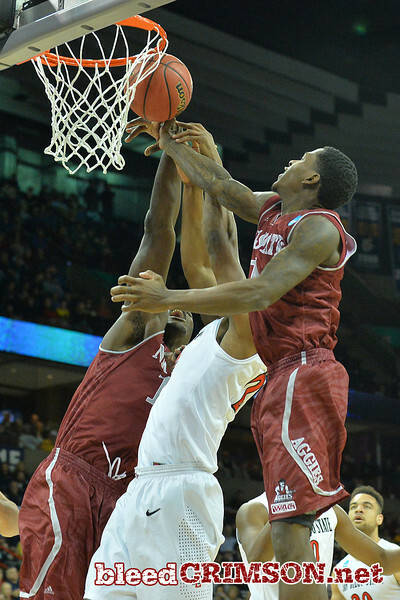 March 20, 2014: New Mexico State Aggies forward Renaldo Dixon (25) battles San Diego State Aztecs forward Dwayne Polee II (5) for a rebound during a second round game of the NCAA Division I Men's Basketball Championship between the 4-seed San Diego State Aztecs and the 13-seed New Mexico State Aggies at Spokane Arena in Spokane, Wash. San Diego State defeated New Mexico State 73-69 in overtime. 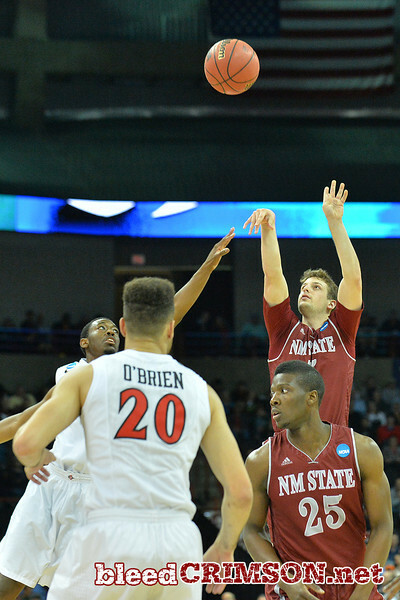 March 20, 2014: New Mexico State Aggies guard Kevin Aronis (5) shoots a three pointer during a second round game of the NCAA Division I Men's Basketball Championship between the 4-seed San Diego State Aztecs and the 13-seed New Mexico State Aggies at Spokane Arena in Spokane, Wash. San Diego State defeated New Mexico State 73-69 in overtime. 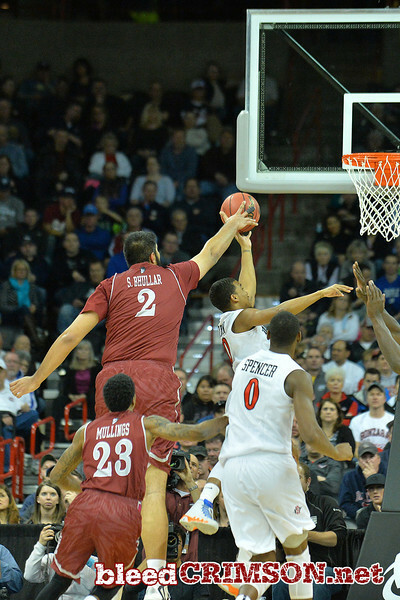 March 20, 2014: New Mexico State Aggies center Sim Bhullar (2) blocks a shot but was called for a foul during a second round game of the NCAA Division I Men's Basketball Championship between the 4-seed San Diego State Aztecs and the 13-seed New Mexico State Aggies at Spokane Arena in Spokane, Wash. San Diego State defeated New Mexico State 73-69 in overtime. 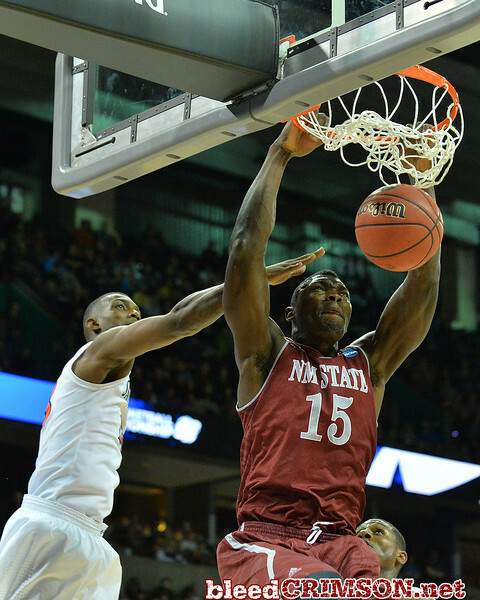 March 20, 2014: New Mexico State Aggies center Tshilidzi Nephawe (15) looks to get to the basket during a second round game of the NCAA Division I Men's Basketball Championship between the 4-seed San Diego State Aztecs and the 13-seed New Mexico State Aggies at Spokane Arena in Spokane, Wash. San Diego State defeated New Mexico State 73-69 in overtime. 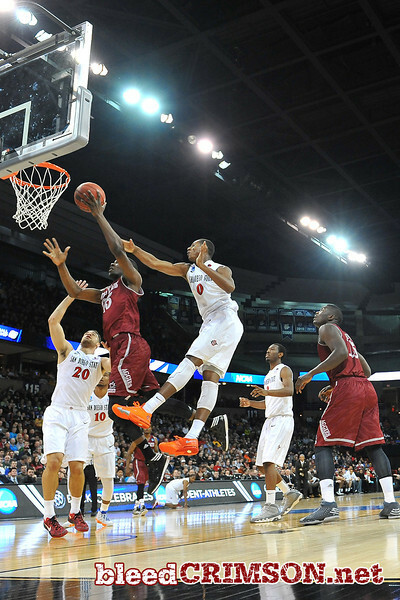 March 20, 2014: New Mexico State Aggies has his shot contested by San Diego State Aztecs forward Skylar Spencer (0) during a second round game of the NCAA Division I Men's Basketball Championship between the 4-seed San Diego State Aztecs and the 13-seed New Mexico State Aggies at Spokane Arena in Spokane, Wash. San Diego State defeated New Mexico State 73-69 in overtime. 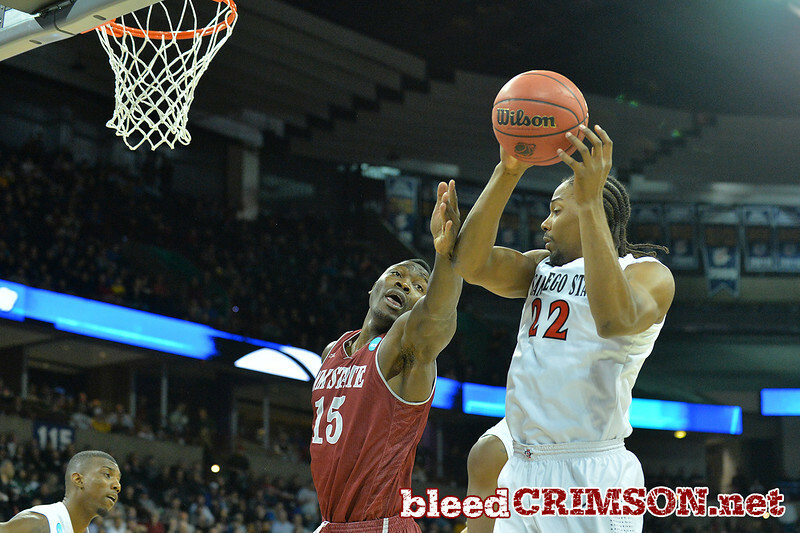 March 20, 2014: San Diego State Aztecs forward Skylar Spencer (0) passes of the defense of New Mexico State Aggies forward Renaldo Dixon (25) during a second round game of the NCAA Division I Men's Basketball Championship between the 4-seed San Diego State Aztecs and the 13-seed New Mexico State Aggies at Spokane Arena in Spokane, Wash. San Diego State defeated New Mexico State 73-69 in overtime. 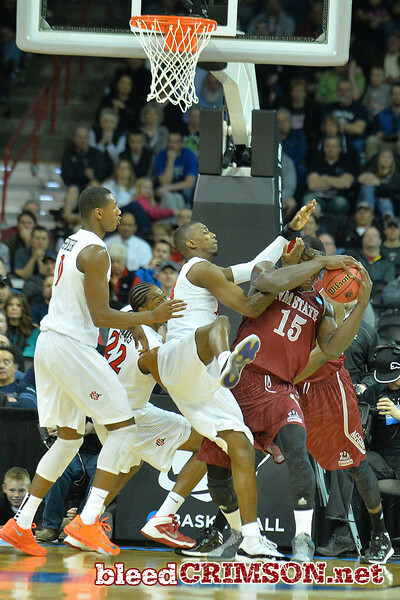 March 20, 2014: New Mexico State Aggies forward Renaldo Dixon (25) is fouled by San Diego State Aztecs forward Skylar Spencer (0) during a second round game of the NCAA Division I Men's Basketball Championship between the 4-seed San Diego State Aztecs and the 13-seed New Mexico State Aggies at Spokane Arena in Spokane, Wash. San Diego State defeated New Mexico State 73-69 in overtime. 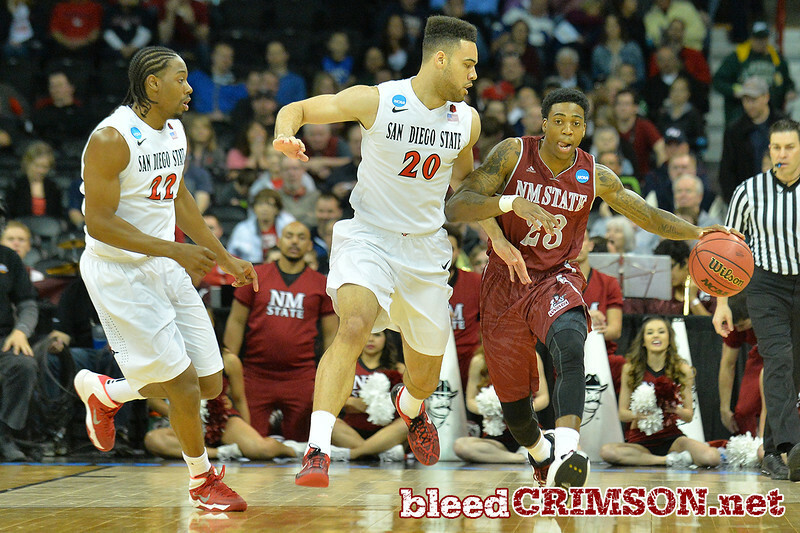 March 20, 2014: New Mexico State Aggies center Tshilidzi Nephawe (15) and New Mexico State Aggies forward Renaldo Dixon (25) battle San Diego State Aztecs forward JJ O'Brien (20) and San Diego State Aztecs forward Skylar Spencer (0) for a rebound during a second round game of the NCAA Division I Men's Basketball Championship between the 4-seed San Diego State Aztecs and the 13-seed New Mexico State Aggies at Spokane Arena in Spokane, Wash. San Diego State defeated New Mexico State 73-69 in overtime. 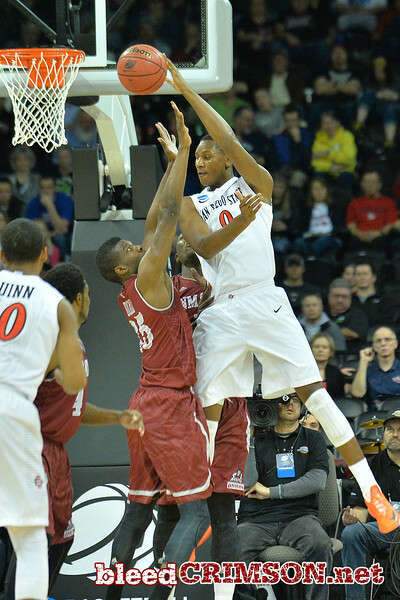 March 20, 2014: San Diego State Aztecs forward Josh Davis (22) battles New Mexico State Aggies forward Renaldo Dixon (25) for a rebound during a second round game of the NCAA Division I Men's Basketball Championship between the 4-seed San Diego State Aztecs and the 13-seed New Mexico State Aggies at Spokane Arena in Spokane, Wash. San Diego State defeated New Mexico State 73-69 in overtime. 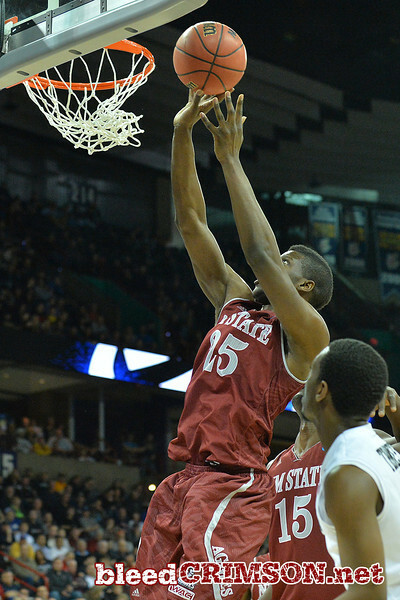 March 20, 2014: New Mexico State Aggies forward Renaldo Dixon (25) grabs a rebound during a second round game of the NCAA Division I Men's Basketball Championship between the 4-seed San Diego State Aztecs and the 13-seed New Mexico State Aggies at Spokane Arena in Spokane, Wash. San Diego State defeated New Mexico State 73-69 in overtime. 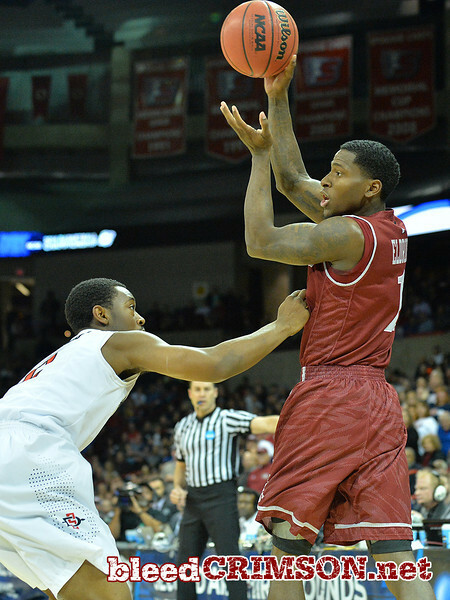 March 20, 2014: New Mexico State Aggies forward Renaldo Dixon (25) puts up a shot during a second round game of the NCAA Division I Men's Basketball Championship between the 4-seed San Diego State Aztecs and the 13-seed New Mexico State Aggies at Spokane Arena in Spokane, Wash. San Diego State defeated New Mexico State 73-69 in overtime. 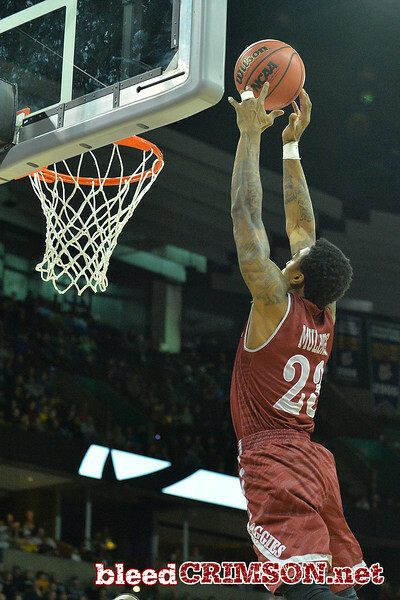 March 20, 2014: New Mexico State Aggies forward Renaldo Dixon (25) goes up for a lyaup during a second round game of the NCAA Division I Men's Basketball Championship between the 4-seed San Diego State Aztecs and the 13-seed New Mexico State Aggies at Spokane Arena in Spokane, Wash. San Diego State defeated New Mexico State 73-69 in overtime. 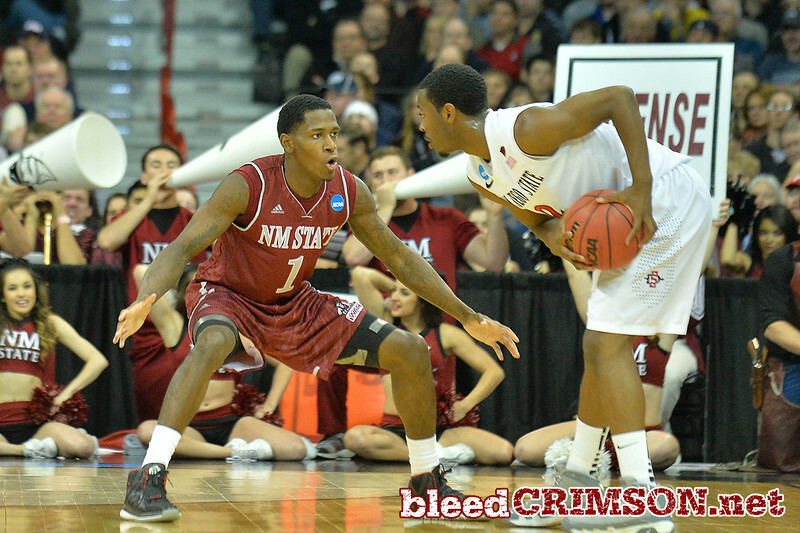 March 20, 2014: New Mexico State Aggies guard DK Eldridge (1) plays defense during a second round game of the NCAA Division I Men's Basketball Championship between the 4-seed San Diego State Aztecs and the 13-seed New Mexico State Aggies at Spokane Arena in Spokane, Wash. San Diego State defeated New Mexico State 73-69 in overtime. 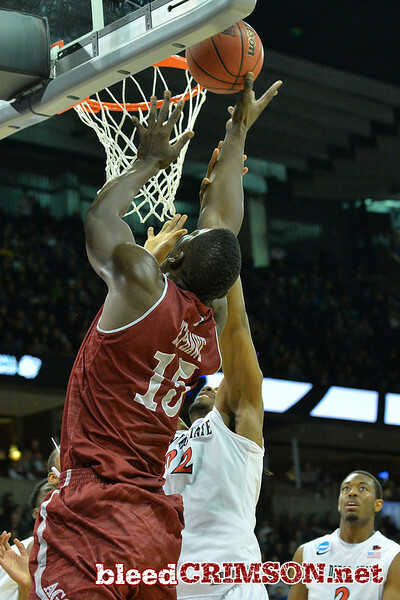 March 20, 2014: New Mexico State Aggies center Tshilidzi Nephawe (15) gets a dunk during a second round game of the NCAA Division I Men's Basketball Championship between the 4-seed San Diego State Aztecs and the 13-seed New Mexico State Aggies at Spokane Arena in Spokane, Wash. San Diego State defeated New Mexico State 73-69 in overtime. 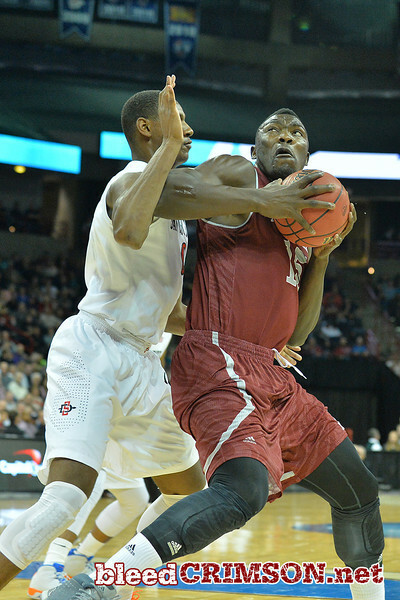 March 20, 2014: New Mexico State Aggies forward Renaldo Dixon (25) contests a shot during a second round game of the NCAA Division I Men's Basketball Championship between the 4-seed San Diego State Aztecs and the 13-seed New Mexico State Aggies at Spokane Arena in Spokane, Wash. San Diego State defeated New Mexico State 73-69 in overtime. 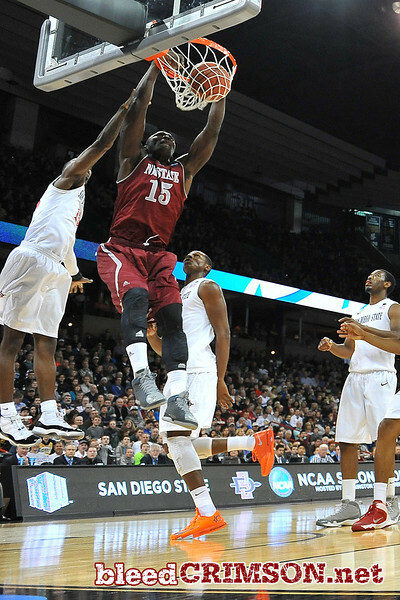 March 20, 2014: New Mexico State Aggies center Tshilidzi Nephawe (15) dunks during a second round game of the NCAA Division I Men's Basketball Championship between the 4-seed San Diego State Aztecs and the 13-seed New Mexico State Aggies at Spokane Arena in Spokane, Wash. San Diego State defeated New Mexico State 73-69 in overtime. 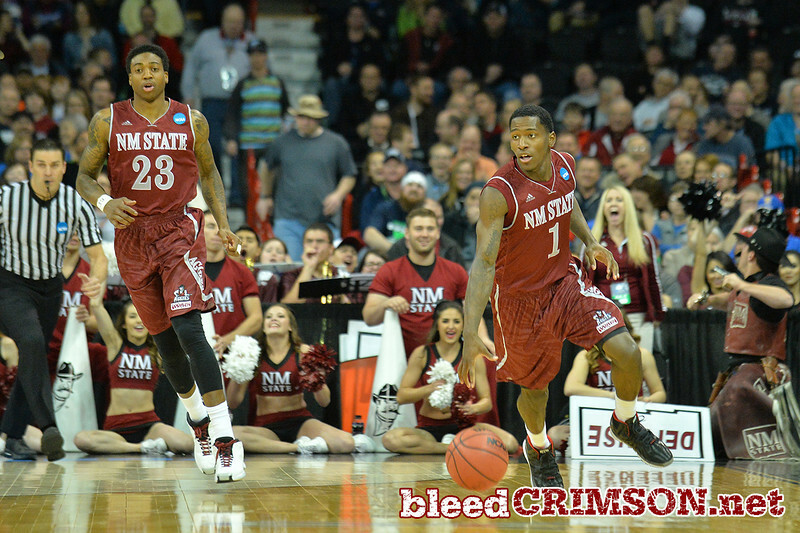 March 20, 2014: Members of the New Mexico State Aggies Sundancer perform during a second round game of the NCAA Division I Men's Basketball Championship between the 4-seed San Diego State Aztecs and the 13-seed New Mexico State Aggies at Spokane Arena in Spokane, Wash. San Diego State defeated New Mexico State 73-69 in overtime. 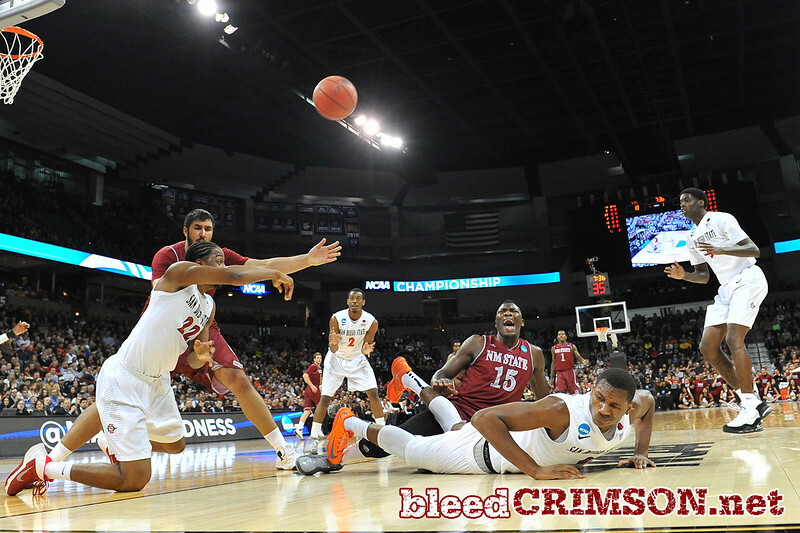 March 20, 2014: San Diego State Aztecs forward Josh Davis (22) scrambles for a loose ball during a second round game of the NCAA Division I Men's Basketball Championship between the 4-seed San Diego State Aztecs and the 13-seed New Mexico State Aggies at Spokane Arena in Spokane, Wash. San Diego State defeated New Mexico State 73-69 in overtime. 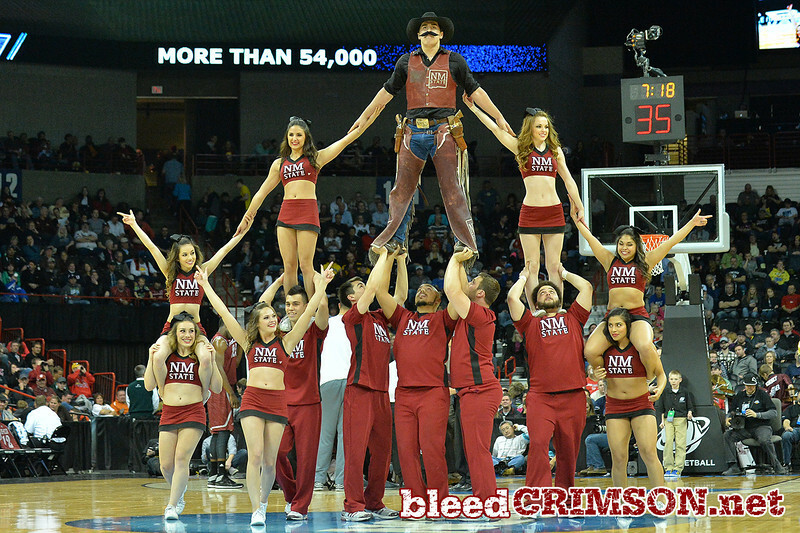 March 20, 2014: Members of the New Mexico State Aggies cheerleading squad perform during a second round game of the NCAA Division I Men's Basketball Championship between the 4-seed San Diego State Aztecs and the 13-seed New Mexico State Aggies at Spokane Arena in Spokane, Wash. San Diego State defeated New Mexico State 73-69 in overtime. 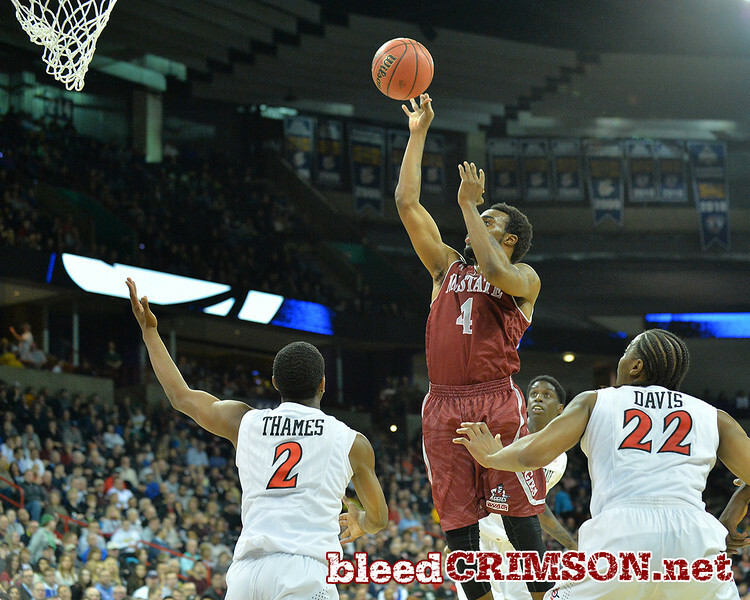 March 20, 2014: New Mexico State Aggies guard Ian Baker (4) puts up a shot during a second round game of the NCAA Division I Men's Basketball Championship between the 4-seed San Diego State Aztecs and the 13-seed New Mexico State Aggies at Spokane Arena in Spokane, Wash. San Diego State defeated New Mexico State 73-69 in overtime. 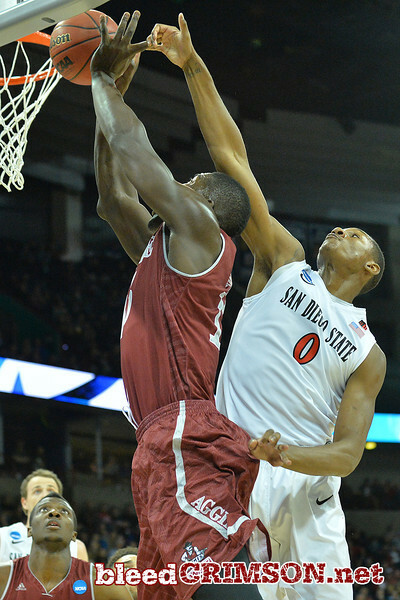 March 20, 2014: San Diego State Aztecs forward Matt Shrigley (40) blocks a shot by New Mexico State Aggies center Tshilidzi Nephawe (15) during a second round game of the NCAA Division I Men's Basketball Championship between the 4-seed San Diego State Aztecs and the 13-seed New Mexico State Aggies at Spokane Arena in Spokane, Wash. San Diego State defeated New Mexico State 73-69 in overtime. 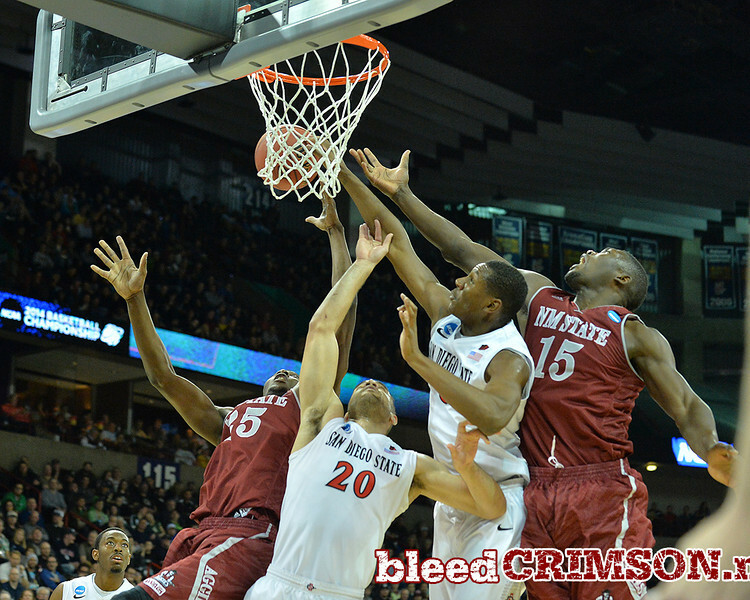 March 20, 2014: New Mexico State Aggies center Tshilidzi Nephawe (15) grabs a rebound during a second round game of the NCAA Division I Men's Basketball Championship between the 4-seed San Diego State Aztecs and the 13-seed New Mexico State Aggies at Spokane Arena in Spokane, Wash. San Diego State defeated New Mexico State 73-69 in overtime. 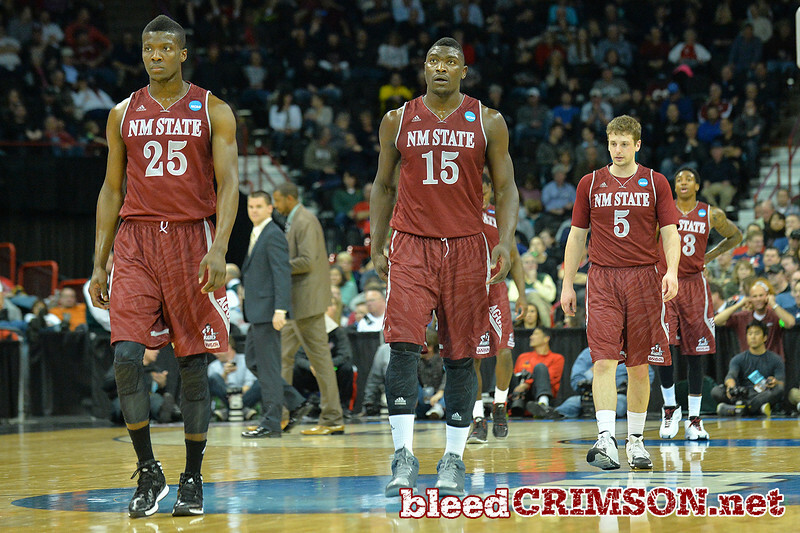 March 20, 2014: New Mexico State Aggies forward Renaldo Dixon (25), New Mexico State Aggies center Tshilidzi Nephawe (15), New Mexico State Aggies guard Kevin Aronis (5) and New Mexico State Aggies guard Daniel Mullings (23) walk back onto the court after a timeout during a second round game of the NCAA Division I Men's Basketball Championship between the 4-seed San Diego State Aztecs and the 13-seed New Mexico State Aggies at Spokane Arena in Spokane, Wash. San Diego State defeated New Mexico State 73-69 in overtime. 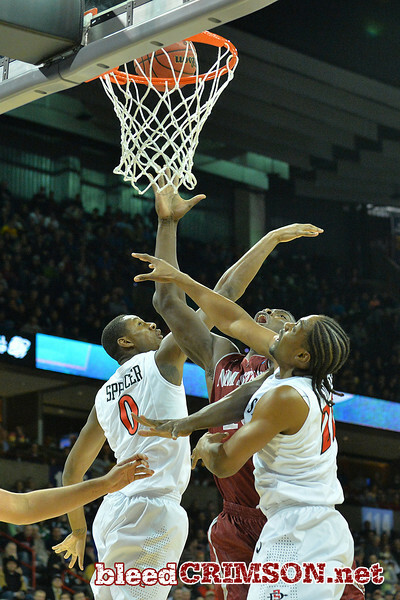 March 20, 2014: San Diego State Aztecs forward Josh Davis (22), New Mexico State Aggies forward Renaldo Dixon (25) and New Mexico State Aggies guard Daniel Mullings (23) battle for a rebound during a second round game of the NCAA Division I Men's Basketball Championship between the 4-seed San Diego State Aztecs and the 13-seed New Mexico State Aggies at Spokane Arena in Spokane, Wash. San Diego State defeated New Mexico State 73-69 in overtime.